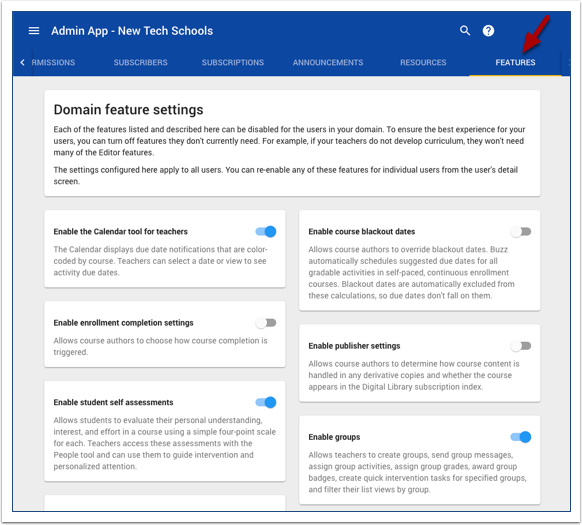 To reduce unnecessary complexity, Echo recently made some changes to the default settings for the Advanced Features to hide features that were not being used in most schools. Without training and support for teachers' instructional practices, it's common for teachers to use these features in ways that can unnecessarily increase their workload or interfear with student learning. Four of those features are more likely to be used than the others (see attached .pdf file). Group-Specific Settings: Allows teachers to customize the course content for students based on group association. To enable or disable advanced features in your domain or to enabled advanced features for just those individual staff members who use them, see this document for guidance.